A memorial to children who lost their lives working in Whitehaven’s coal mines has been enhanced by restoration work. 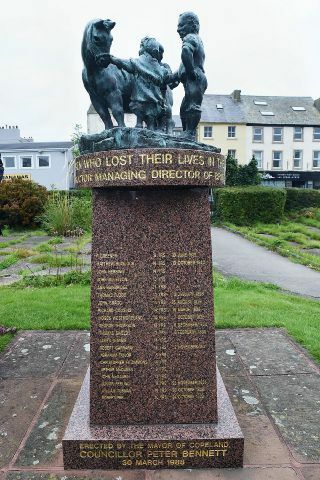 The Children’s Mining Memorial in St Nicholas’ Gardens (Photo courtesy of Mike McKenzie). Whitehaven Heritage Action Group received £900 towards the project from the Cumbria Endowment Grassroots Grants Fund. The memorial stone, in St Nicholas’ Gardens, Whitehaven, had its lettering regilded by a local stonemason. The monument was installed in the 1980s and bears the names of 77 children who died while coal mining in the town. Some of the children were as young as 8 years old. Ray Devlin, 83, a local mining historian and ex-miner, unveiled the revitalised monument. Mr Devlin was at the original unveiling in 1985 and has written a book entitled ‘Children of the Mines’. The brother of his great, great grandmother is named on the monument. Margaret Crosby, Secretary for Whitehaven Heritage Group said: “This project has ensured that the children who worked and died in the local coal mines at a time when child labour was the norm, are not forgotten.